We just love having fresh banana bread in our kitchen. We most often have just a simple banana nut bread. Other times, we speak the kids’ love language by adding chocolate chip morsels and baking a fancy bundt cake. Another unusual yet delicious way to enjoy banana bread is with zucchini, oh how I love the unexpected combination. And then there’s the recipe for these banana bread muffins. Though we often enjoy banana bread, we never made muffins out of a banana bread recipe. So, today I share with you our new favorite banana bread recipe in muffin form with a delicious and easy cream cheese frosting. The frosting takes these banana bread muffins from good to great. Anytime you add cream cheese to the equation it just bumps up the recipe to a whole new level of approval. When I was testing this recipe, I was a little concerned how the recipe would taste as a muffin. I was so pleasantly surprised by the softness of the muffin. You couldn’t tell it was a banana recipe but it was so good. I had to tweak the recipe a few times to get them to just the way I liked them so I had several dozen plain muffins without the frosting. The kiddos didn’t mind, they were gone as soon as they got home from school. The face of approval from the children and my biggest recipe critic, my husband, makes my heart sing. It’s one thing to have a recipe your kids enjoy really enjoy, it’s even more pleasing when your husband approves of the recipe. However, when the Mr. and the kiddos approve and tell mom she needs to post the recipe, you smile with satisfaction. This recipe has the ingredients for a basic banana bread. If you’d like, you can add some other ingredients to the mixture: chocolate chip morsels, craisins, raisins, white chocolate or even give it a healthy spin with grated zucchini. All of these ingredients would go well with the lemon cream cheese frosting. I love the flavor the fresh squeeze lemon adds to the frosting. It’s so good and unexpected with the banana muffins. , they are so adorable. Great way to fancy up the muffins for a special occasion. 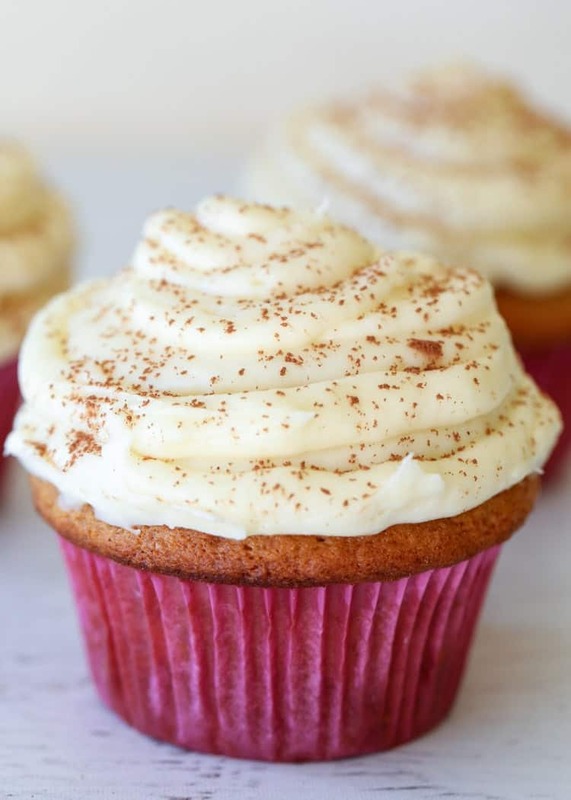 If you make these BANANA BREAD MUFFINS CREAM CHEESE FROSTING, please tag us in your creations, #ValentinasCorner. Or, e-mail us your dinners to valentina@valentinascorner.com. We LOVE seeing your recipes :)! Raspberry Chocolate Chip Banana Bread- A delicious banana bread with white chocolate and raspberries. Banana Nut Bread- A simple and delicious banana bread recipe. Banana Chocolate & Cream Cheese Bundt Cake– Bananas with cream cheese, and melted chocolate. Yum! 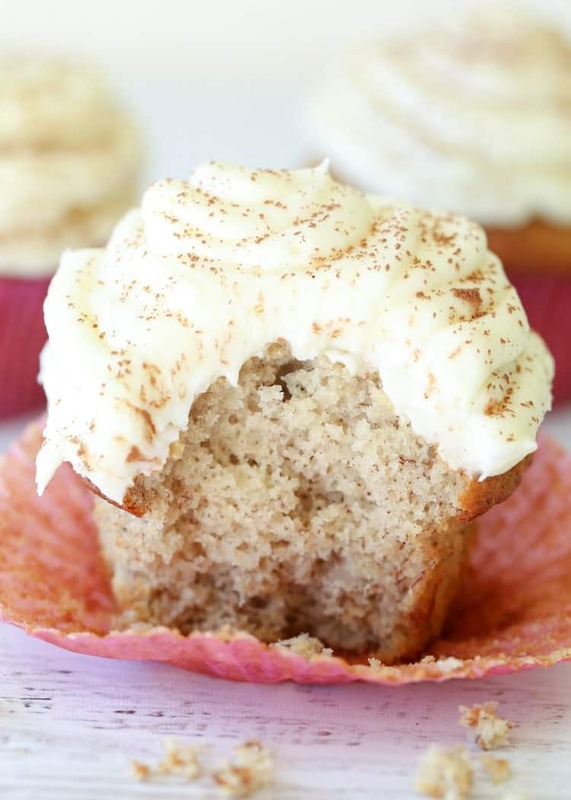 Easy recipe for banana bread muffins with a lemon cream cheese frosting. Preheat oven to 355°F at step 7. Line muffin pan with cupcake cups. Coat with baking spray. In a bowl, combine flour, cinnamon, baking soda and baking powder. Set aside. In a small bowl, combine the sour cream and vinegar. With a fork, mash the bananas. Add bananas, sour cream mixture, oil and vanilla to sugar/egg bowl. Give it a quick mix. Add the flour mixture and mix until fully incorporated. Divide the batter evenly between the cupcake cups. Bake at 355°F for 18-22 minutes or until toothpick comes out clean. Meanwhile, prepare the cream cheese frosting. In a bowl, beat cream cheese with butter. Add powdered sugar, lemon, vanilla and mix until combined. Refrigerate until ready for use. Cool muffins completely. Pipe frosting onto muffins. Store cupcakes in an airtight container. Made these tonight and my husband and son LOVED them. That’s wonderful, Kyle. Thanks so much for sharing. These are great! So soft and the cream cheese is wonderful! Love the kick the lemon gives!